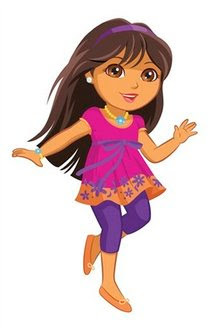 The 7 year old latina girl doll Dora the Explorer is growing up. This was a buzz a month ago and according to reports Mattel will launch a tweenage version of Dora the Explorer catered to the girls ages 5 years old and up. Dora the Explorer the Cartoon series can be seen in Nickelodeon with her talking monkey, boots and some spanish lessons from Dora herself. From what I have heard, it has been a mix reaction. Some like the new Dora and some don't. For me, it's quite okay. At least girls can still grow up with their loved Dora. now im not sure if im going to let my daughter watch dora. she's still too young for a tweenage dora.